If you are looking for powerful, trendy, and a premium responsive multi-purpose theme, then your hunt stops at “Surya Chandra”. Surya Chandra theme comes with features that are certainly more than almost any other themes available till date. It has been designed and coded to extremely fulfill your demands and needs. Being a flexible theme Surya Chandra is suitable for an agency, blogs, business corporate or portfolios. 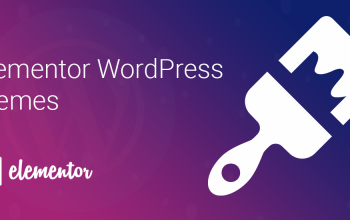 Highlighting special features, we would like to add that it is powered by drag and drop page builder, SiteOrigin Page Builder which makes easy and smooth as butter for customization all by yourself. Without putting any extra efforts, you can easily create custom layouts while you are using multiple widgets that comes with Surya Chandra. With the support of multiple color schemes and font options, you are already set to boost your online presence. Surya Chandra also features demo contents files which enables you to one click demo import. What is Surya Chandra offering you? 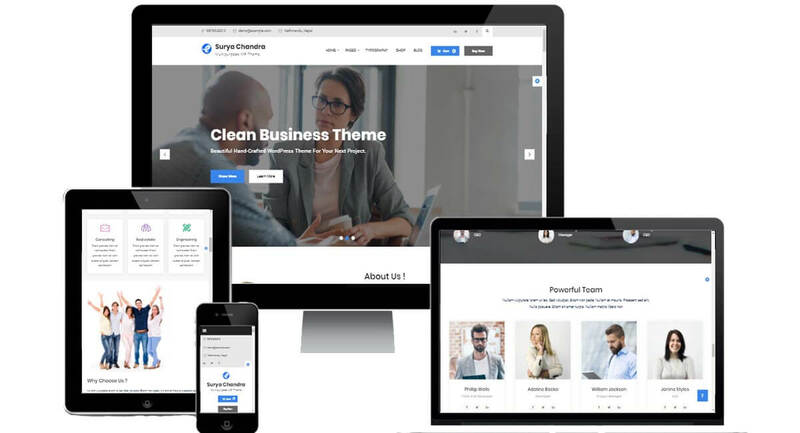 As we have already mentioned that Surya Chandra is a multipurpose responsive theme it is packed with tons of features to offer you. Below we have highlighted some of the important features that make you lean toward this theme. 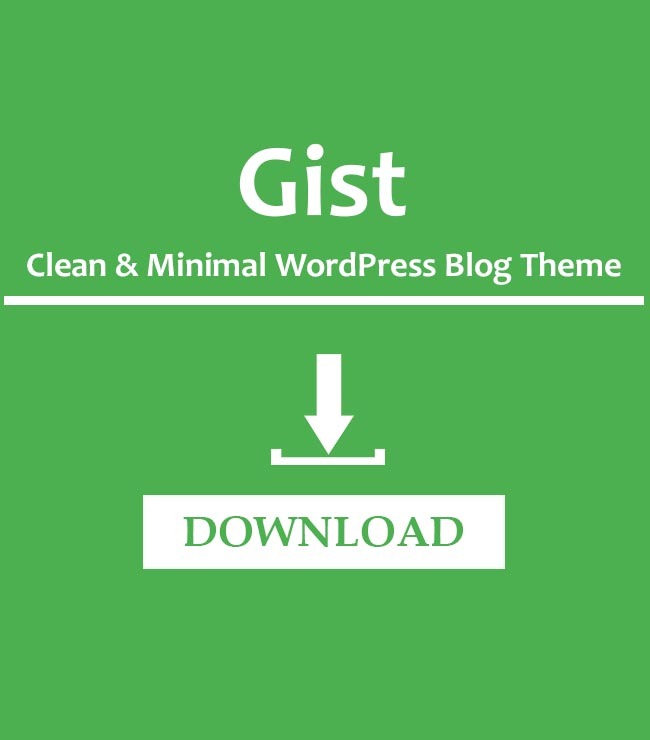 Features of this multipurpose theme are not limited to this. Buckle up guys, there are lot more features for you to make your online presence more elegant & catchy. Some of the meticulously crafted features of this theme are described below. You might have sketched 3-4 different varieties of layouts for your website. 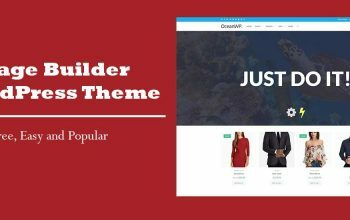 But wait, drag and drop page builder feature of this magnificent theme allows you to create UNLIMITED variations of layout, still making your site unique in the trend. Theme Customizer feature can’t remain hidden. Making user customize their site and see a live preview of the changes without having to toggle back and forth, its loved and liked by all of us. Gosh, things are getting “easy” these days isn’t it? 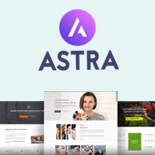 Like other themes, Surya Chandra also supports homepage builder, but the difference you’ll notice here is the awesome functionality to change homepage elements using Drag-n-Drop. We have been saying that Surya Chandra is a responsive theme and again we would like to state that, Surya Chandra is 100% mobile responsive. Either you are using mobile phones, iPads, laptops or even desktop, your brand is already responsive to any type of devices being powered by Surya Chandra. Customization is the need of human life today and everyone seeks for an easy method to get their job done. Featuring visual built-in theme options, unlimited color, and fonts and more visual tools you can easily customize your site without editing a single line of code. Pre-made demo contents are already packed with Surya Chandra, you just need to push the Import button to let the curtain fall down and make your demo site ready. Isn’t it cool?? Don’t worry about how to setup this theme. With the help of this feature, you can easily set up your site like demos. 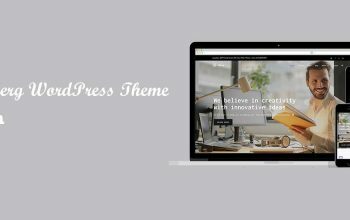 Using WordPress theme is simple if it has demo import feature. We strongly recommend this theme because you can easily set up this theme on your server. Sorry, but if you are using Surya Chandra you won’t be able to see that tiny circle going round and round, or text “Please Wait” and “Loading”. Surya Chandra cares that loading time affects your online presence thus, it is already optimized for super-fast loading. Mentioned earlier, Surya Chandra is the multipurpose theme and they are serious about the word multipurpose. Those who are using this theme for blogging or corporate purposes, wake up guys! You have the power to open an online store. Yes, you got us right. 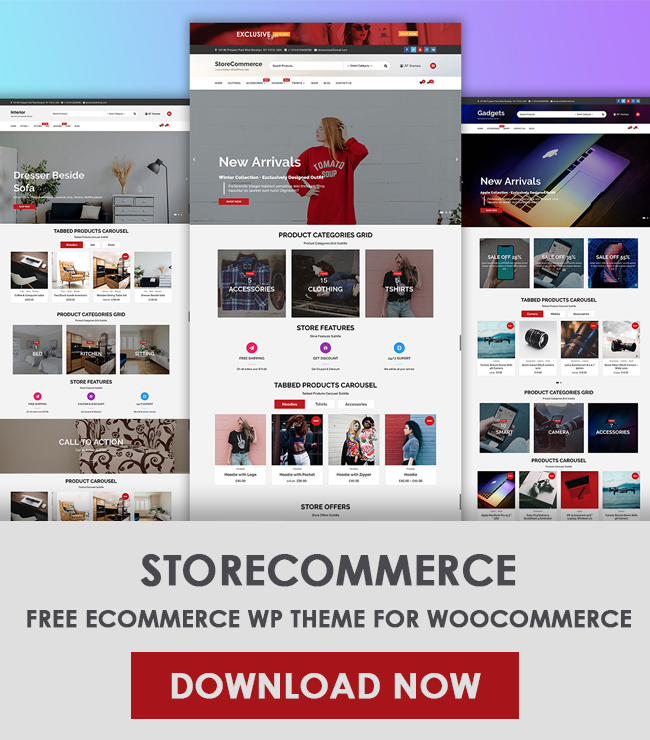 Surya Chandra is WooCommerce ready and fully compatible with WooCommerce plugin. Hence, you can start selling your products instantly without any delay. With Surya Chandra, you will get varieties of widgets to change and make custom layouts of your page. Add blog posts, ads, social media link and site content in the sidebar while you simply drag and drop them in right place. An artist can only describe you about colors. Surya Chandra has an artistic feature of multiple colors schemes to enable you to choose different colors. Now, you don’t have to compromise on your branding, with this feature you can choose the best color scheme which suits your logo and branding colors. Surya Chandra is more focused on its simplicity and efficiency. Keeping this in the mind, Surya Chandra has provided different page templates like Full Width, Builder, and few others so that you can instantly create these common pages. Want to make your site fresh and appealing? Surya Chandra is featuring a huge pack of Google fonts, ready to be deployed. You can choose and use different Google fonts for your canvas to give a modernized look and feel. Do you want to check the free version before moving to premium? WEN Themes provides you the free version of this theme as well. You can check the free version and then you can upgrade to pro later too. But we recommend you to use the premium version instead of using free because you will get dedicated support, regular updates, more features on the premium version. You want to know the differences between free and pro before upgrading or buying the pro version? Check differences between the free and premium version in the below section.